Prepare to be inspired on Sunday, May 20 at the Invent the Future Challenge Summit as you see middle schoolers turned inventors from across the region present creative solutions to the question: What will you make to protect the planet? At this inaugural event, student teams will present their prototyped inventions to a panel of industry experts and to the general public. The event will also feature guest speakers, an exhibitor expo, a recognition ceremony, and a crowd favorite—food trucks! Vote for the Audience Choice Award. While a panel of experts will be on-hand to recognize teams across a variety of areas like originality and team collaboration, your vote will help decide which team wins the Audience Choice Award. Hear from Alan Gregerman, an internationally-respected innovation consultant, a best-selling author, educator, and founder of Passion for Learning, Inc. He will be speaking about unlocking genius and the power of curiosity. Meet emerging local innovators and entrepreneurs like Kristof Grina, Founder of Up Top Acres, Jared Lapidus of VegiCity, winner of the local Social Entrepreneurship Tournament for high schoolers, and Wizards.exe, the FIRST Tech Challenge world champs. See young leaders in the making—talk with them, listen to their presentations, interact with their inventions, and see for yourself how maker-based STEM learning can empower our youth to invent the future. Whether you’re excited by innovation and entrepreneurship, seeking new directions in STEM education, looking for an interactive family activity, or simply want to support these students and their hard work, the event is guaranteed to be time well spent. 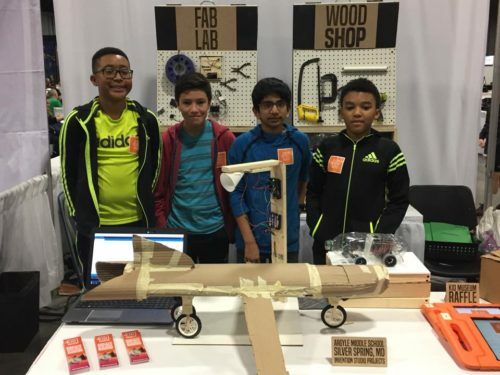 The Invent the Future Challenge Summit will be held at Magruder High School in Rockville, MD on Sunday, May 20 from 1:00pm – 4:00pm, and is presented by KID Museum in partnership with Montgomery County Public Schools.